312 Commercial Real Estate & Properties in Brisbane City are listed in 7 categories. We have 228 OfficesSale & Lease , 56 Retail ShopsSale & Lease , 21 Medical and Consulting PropertiesSale & Lease , 4 Development LandsSale & Lease , 3 Hotels and LeisureSale & Lease and 1 Industrial Warehouses Sale & Lease . Prime Location | Incentives For 12+ Months | Close To Public Transport $901pw | 10 Person Worksp..
PROPERTY OVERVIEW $901pw Price incl. Flexible office space for rent close to the Golden Triangle and Central Station in Brisbane CBD. This 117sqm workspace can be subleased in its entirety or you can rent as many workstations as you need to share the office with the existing tenants. It’s one of four tenancies on the floor which all share a kitchen while its private facilities comprise a smart unmanned reception, 5 person meeting room and a tea & coffee station. It is fitted with modern furniture, business grade internet and 24/7 access to provide a small business with everything they need. Set up and ready to use, this workspace removes the costs and hassle of renting office space while granting the prestige of your own Brisbane CBD address. One month rolling contracts available for sharing the space, while longer terms are preferable for a sublease of the whole office – please enquire to discuss! Book a tour through Office Hub today. 99 Creek Street is a landmark heritage building prominently located on the corner of Creek and Adelaide Streets in the Golden Triangle. One of the city’s most cherished heritage buildings, 99 Creek comprises a ground floor retail suite and five levels of boutique office accommodation with historic features throughout, including large retained windows, exposed timber beams and high ceilings. The six storey building has been sensitively refurbished to accommodate the modern worker with end of trip facilities and ample basement car parking available at market rates. It is desirable for its Golden Triangle location, proximity to Central Station and convenience to Queen Street Mall, all of which have made this location particularly desirable among professional services organisations operating in Brisbane CBD. The advertised office space is perfect for a team of 10. If you need more or less space, we have over 30,000 furnished workspaces all over the world suitable for a team of 1 to 200+. Our award winning team offer a free service that will help you find the perfect solution for your needs, so reach out if you need more help. What you get for your weekly rent , 24/7 Access , 24/7 Security , Access to kitchen facilities , A prestigious address to put on your business cards , Building outgoings included , Electricity usage included , Flexible lease terms from 1 month , Flexible lease with the ability to grow into bigger space , Regular cleaning , Unfurnished office space with shared facilities Building features , Abundance of natural light , Air conditioning , Car parking in building (Paid) , Direct access to public transport , Disabled access and facilities , End of trip facilities e.g showers, bike racks , Heritage listed building , Professional working environment , Retail and shopping malls nearby Prime Golden Triangle location 250m to Central Train Station 500m to Riverside Ferry Terminal Bus stops in front of the building 300m to Queen Street Mall Who is Office Hub? Office Hub is the world\'s No.1 marketplace for office space. We have a huge global selection of coworking spaces, serviced offices and shared office spaces with flexible options to suit teams from 1 200 people. We\'ll take you on a tour of all the workspaces that fit your needs and work on your behalf to get the best price possible. We\'ll help you discover how shared office space can be the most beneficial and budget friendly solution for your business. www.office hub.com Conditions apply – the advertised price includes any incentives offered based on a 12 month agreement and is available to new tenants only. Please note that the rental rate may increase for a shorter rental period. A portion of the square meterage factors in access to shared space. Central Location | Dedicated Receptionist | Fully Furnished $574pw | 4 Person Workspa..
PROPERTY OVERVIEW $574pw Price incl. Contemporary serviced office in Brisbane CBD. Price incl. Internet, Rent, Electricity, Building Outgoings & All Utility Bills Flexi terms Spacious office Regular cleaning 24/7 access Dedicated receptionist Central CBD Location Avail NOW for short or long term rent This brand new premium grade building is ideally located in Brisbane's financial district, with impressive views over Brisbane River. Located in the building is a dedicated level known as the 'parkland' for tenants to extend their work life balance, showcasing beautiful timber and a variety of plant life. The workspaces are comfortable, professional and well equipped with support teams to help productivity. Enquire because this unique and inspiring space will go quickly! The advertised office space is perfect for a team of 4. If you need more or less space, we have over 30,000 furnished workspaces all over the world suitable for a team of 1 to 200+. Our award winning team offer a free service that will help you find the perfect solution for your needs, so reach out if you need more help. What you get for your weekly rent Furnished office with dedicated desks, chairs and lock up storage units Complimentary receptionist to meet and greet your clients Unlimited commercial grade internet service Electricity usage included Regular cleaning Telephone number & handset Prestigious business address to put on your cards Flexible terms Ability to bring your existing phone number over 24 x 7 access to your office 24 x 7 security Office features City views from selected offices Full mail management and postage Large boardroom and meeting rooms Server / Comms rooms available for server storage Signage board in foyer to highlight your business name Building features Modern high rise building Car parking in building and surrounding areas On site Sandwich/Coffee bar On site gym and day care Bike stations Showers 3 minute walk to Riverside's City Cat Ferry 10 minute walk to Central Train Station Close to shopping malls, cafes, shops, pubs in fact everything! WHO IS OFFICE HUB? Office Hub is Australia & New Zealand\'s No 1 small office space commercial real estate agency. We have the largest collection of shared spaces, coworking and serviced offices in Australia & New Zealand, perfect for 1 100 employees. Let us take you on a tour of all the spaces that fit your needs and budget. Our service is complimentary and we work for you and the landlord to negotiate the most competitive deal in the market. Let us show you how shared and serviced offices can be the perfect solution for your business. www.office hub.com.au www.office hub.co.nz Conditions apply A portion of the square meterage factors in access to shared space. Price includes any incentives offered. This is for new tenants only. Prestigious Location | Fabulous Views | Premium Grade Office Space $397pw | 3 Person Workspa..
PROPERTY OVERVIEW $397pw Price incl. Large serviced office space in amazing "Golden Triangle" location. Price incl. Internet, Electricity, Building Outgoings & All Utility Bills Modern fit out Flexi terms Plenty of natural light 24/7 access Fully furnished Central Brisbane CBD location Available NOW for long or short term lease These modern, professional offices are conveniently situated within the "Golden Triangle" of Brisbane's CBD and within 5 minutes of all public transport. Offering generously sized offices that are bright, airy and decorated with colourful artwork adds to the relaxed atmosphere of this workspace. Along with a dedicated and friendly onsite team tenants needs will be catered to effectively. The advertised office space is perfect for a team of 3. If you need more or less space, we have over 30,000 furnished workspaces all over the world suitable for a team of 1 to 200+. Our award winning team offer a free service that will help you find the perfect solution for your needs, so reach out if you need more help. What you get for your weekly rent 24/7 Access Building outgoings included Electricity included Commercial grade internet Access to shared meeting and boardrooms Regular cleaning Flexible terms Office and Building features Furnished with desks and chairs Natural light Spacious offices Wi fi Dedicated mens and ladies bathrooms Postal facilities available Reception services Administration support available Ground floor security Telephone provided and telephone answering services Photocopying facilities Access to shared kitchen Conference facilities available ATM located on the ground floor Post Office Square located next door Rush bar & Restaurant located on the ground floor 120m to Queen Street Mall 150m to Woolworths All major banks nearby WHO IS OFFICE HUB? Office Hub is Australia & New Zealands No 1 small office space commercial real estate agency. We have the largest collection of shared spaces, coworking and serviced offices in Australia & New Zealand, perfect for 1 200 employees. Let us take you on a tour of all the spaces that fit your needs and budget. Our service is complimentary and we work for you and the landlord to negotiate the most competitive deal in the market. Let us show you how shared and serviced offices can be the perfect solution for your business. www.office hub.com.au www.office hub.co.nz Conditions apply A portion of the square meterage factors in access to shared space. Price includes any incentives offered. This is for new tenants only. Close To Train | Prime Location | Fabulous Views $332pw | 4 Person Workspa..
PROPERTY OVERVIEW $332pw Price incl. Contemporary serviced offices in Brisbane. Price includes Internet, Telephone, Electricity Flexi terms Cleaning 24/7 access Full time Receptionist Brisbane CBD Location Avail NOW for short or long term rent Located in the heart of Brisbane at 127 Creek Street, these spacious serviced offices provide ready access to the Queen Street Mall and close to public transport, making it perfect for anyone and everyone. This centre offers inspirational views over Brisbane CBD and quality facilities over three levels. The advertised office space is perfect for a team of 4. If you need more or less space, we have over 30,000 furnished workspaces all over the world suitable for a team of 1 to 200+. Our award winning team offer a free service that will help you find the perfect solution for your needs, so reach out if you need more help. What you get for your weekly rent Furnished office with desks, chairs and lock up storage units Complimentary receptionist to meet and greet your clients Unlimited commercial grade internet service Electricity usage included Regular cleaning Telephone number & handset Unlimited kitchen supplies, incl. tea, coffee & filtered water Prestigious business address to put on your cards Flexible terms from 1 month 2 years Ability to bring your existing phone number over 24 x 7 access to your office 24 x 7 security Office features City views from selected offices Full mail management and postage Large boardroom and meeting rooms Signage board in foyer to highlight your business name Quality finishes and amenities throughout Professional environment Server / Comms rooms available for server storage Building features Modern high rise building High speed lifts Car parking in building and surrounding areas Dedicated on site management team 24 x 7 security 50m to bus stations 200m to Anzac Square 350m to Ferry pier 150m to Central Train station Close to shopping malls, cafes, shops, pubs in fact everything! WHO IS OFFICE HUB? Office Hub is Australia & New Zealand\'s No 1 small office space commercial real estate agency. We have the largest collection of shared spaces, coworking and serviced offices in Australia & New Zealand, perfect for 1 100 employees. Let us take you on a tour of all the spaces that fit your needs and budget. Our service is complimentary and we work for you and the landlord to negotiate the most competitive deal in the market. Let us show you how shared and serviced offices can be the perfect solution for your business. www.office hub.com.au www.office hub.co.nz Conditions apply A portion of the square meterage factors in access to shared space. Price includes any incentives offered. This is for new tenants only. $332pw | 4 Person Workspa..
$1847pw | 15 Person Works..
PROPERTY OVERVIEW $1847pw Price incl. Premier office space for rent in Brisbane’s prime financial district. This impressive workspace comes from one of the world’s top serviced office operators, delivering a new standard of workplace technology, connectivity and facilities to enhance your working day. Blending a classic corporate fit out with a modern layout to enhance collaboration, it has private offices, coworking desks and virtual offices for rent and the ability to accommodate teams of up to 50 people. The IT in this workspace is undoubtedly one of its most attractive features as it has fibre based Tier 1 internet, 99.99% broadband uptime, low cost international calls on a VOIP network, Cisco Voice and global number portability. The customer service also sets it apart, with extensively trained professionals on hand to take care of reception and admin tasks as well as catering and meeting requests. If you’re interested in this leading Brisbane CBD serviced office, come and meet the team, test the technology and try out the facilities – a quick tour will show you why this office provider is one of the best in the world. This elegant and exclusive serviced office in Brisbane is in one of Australia’s truly iconic buildings. The office tower is known as The Gold Tower for its extraordinary colour and at 135m tall it can be seen from most parts of the city – upon completion in 1977 it was Brisbane’s tallest building. The standout features are the instantly recognisable gold colour, floor plate shaped like the map of Australia and environmentally friendly measures including T5 lighting and sensor lighting which have seen it achieve a 4.5 star NABERS energy rating and 4.0 star NABERS water rating. In house amenities include change rooms, shower, secure bike storage, dry cleaning services, onsite concierge and security. This serviced office offers beautiful views of the Brisbane River, Story Bridge and Moreton Bay and it’s close to the GPO and Eagle Street Pier's restaurant precinct. The advertised office space is perfect for a team of 15. If you need more or less space, we have over 30,000 furnished workspaces all over the world suitable for a team of 1 to 200+. Our award winning team offer a free service that will help you find the perfect solution for your needs, so reach out if you need more help. What you get for your weekly rent Furnished office with desks, chairs and lock up storage units Commercial grade internet service Telephone line and personalised phone answering Use of kitchen facilities with premium coffee/tea service Electricity usage included Complimentary receptionist to meet and greet your clients Prestigious business address Flexible terms from 1 month to long term Ability to bring your existing phone number over Business lounge with complimentary break out areas 24 x 7 Access to your office 24 x 7 security Office features Immaculate fit out and facilities Full mail management and postage Large boardroom and meeting rooms Signage board in foyer to highlight your business name Professional environment Server / Comms rooms available for server storage Building features Modern high rise classified as an "A" grade building 24 x 7 access to your office High speed lifts Car parking in building and surrounding areas Dedicated on site management team The advertised price includes building outgoings and is based on one person occupying the workspace. If you have 2 or more people extra fees will apply to cover off services like telephone, internet and kitchen amenities. 10m to Eagle & Charlotte Street bus stops 91m to Eagle Street Pier Ferry Terminal 650m to Central Station 600m to Queens Plaza 210m to Fitness First Who is Office Hub? Office Hub is the world\'s No.1 marketplace for office space. We have a huge global selection of coworking spaces, serviced offices and shared office spaces with flexible options to suit teams from 1 200 people. We\'ll take you on a tour of all the workspaces that fit your needs and work on your behalf to get the best price possible. We\'ll help you discover how shared office space can be the most beneficial and budget friendly solution for your business. www.office hub.com Conditions apply – the advertised price includes any incentives offered based on a 12 month agreement and is available to new tenants only. Please note that the rental rate may increase for a shorter rental period. A portion of the square meterage factors in access to shared space. Dedicated Receptionist | Recognised Building | Central Location $558pw | 4 Person Workspa..
PROPERTY OVERVIEW $558pw Price incl. Prestigious serviced office space in Brisbane. Price incl. Internet, Rent, Building Outgoings, All Utility Bills Flexi terms Fully furnished Regular cleaning Recognised address 24/7 access Dedicated receptionist Central CBD Location Avail NOW for short or long term rent The business centre in Queen Street, Brisbane is in the well known Central Plaza One building, the most distinctive and largest office complex in Brisbane's Central Business District. The Central Plaza One design was conceived in the image of a "newly discovered crystal". With the roof and corners that gives the appearance of having been cut by a keen blade, this building is sure to get your business recognised. The advertised office space is perfect for a team of 4. If you need more or less space, we have over 30,000 furnished workspaces all over the world suitable for a team of 1 to 200+. Our award winning team offer a free service that will help you find the perfect solution for your needs, so reach out if you need more help. What you get for your weekly rent Furnished office with desks, chairs and lock up storage units Complimentary receptionist to meet and greet your clients Unlimited commercial grade internet service Electricity usage included Regular cleaning Telephone number & handset Prestigious business address to put on your cards Flexible terms from 1 month 2 years Ability to bring your existing phone number over 24 x 7 access to your office 24 x 7 security Office features City views from selected offices Full mail management and postage Large boardroom and meeting rooms Signage board in foyer to highlight your business name Quality finishes and amenities throughout Professional environment Server / Comms rooms available for server storage Building features Modern high rise building High speed lifts Car parking in building and surrounding areas Dedicated on site management team 10m to Ferry Pier 50m to Bus Stop 450m to Central Train station Close to shopping malls, cafes, shops, pubs in fact everything! WHO IS OFFICE HUB? Office Hub is Australia & New Zealand\'s No 1 small office space commercial real estate agency. We have the largest collection of shared spaces, coworking and serviced offices in Australia & New Zealand, perfect for 1 100 employees. Let us take you on a tour of all the spaces that fit your needs and budget. Our service is complimentary and we work for you and the landlord to negotiate the most competitive deal in the market. Let us show you how shared and serviced offices can be the perfect solution for your business. www.office hub.com.au www.office hub.co.nz Conditions apply A portion of the square meterage factors in access to shared space. Price includes any incentives offered. This is for new tenants only. Cafes And Shops Nearby | Regular Cleaning | Dedicated Receptionist $1124pw | 7 Person Worksp..
PROPERTY OVERVIEW $1124pw Price incl. Contemporary serviced office in Brisbane CBD. Price incl. Internet, Rent, Electricity, Building Outgoings & All Utility Bills Flexi terms Spacious office Regular cleaning 24/7 access Dedicated receptionist Central CBD Location Avail NOW for short or long term rent This brand new premium grade building is ideally located in Brisbane's financial district, with impressive views over Brisbane River. Located in the building is a dedicated level known as the 'parkland' for tenants to extend their work life balance, showcasing beautiful timber and a variety of plant life. The workspaces are comfortable, professional and well equipped with support teams to help productivity. Enquire because this unique and inspiring space will go quickly! The advertised office space is perfect for a team of 7. If you need more or less space, we have over 30,000 furnished workspaces all over the world suitable for a team of 1 to 200+. Our award winning team offer a free service that will help you find the perfect solution for your needs, so reach out if you need more help. What you get for your weekly rent Furnished office with dedicated desks, chairs and lock up storage units Complimentary receptionist to meet and greet your clients Unlimited commercial grade internet service Electricity usage included Regular cleaning Telephone number & handset Prestigious business address to put on your cards Flexible terms Ability to bring your existing phone number over 24 x 7 access to your office 24 x 7 security Office features City views from selected offices Full mail management and postage Large boardroom and meeting rooms Server / Comms rooms available for server storage Signage board in foyer to highlight your business name Building features Modern high rise building Car parking in building and surrounding areas On site Sandwich/Coffee bar On site gym and day care Bike stations Showers 3 minute walk to Riverside's City Cat Ferry 10 minute walk to Central Train Station Close to shopping malls, cafes, shops, pubs in fact everything! WHO IS OFFICE HUB? Office Hub is Australia & New Zealand\'s No 1 small office space commercial real estate agency. We have the largest collection of shared spaces, coworking and serviced offices in Australia & New Zealand, perfect for 1 100 employees. Let us take you on a tour of all the spaces that fit your needs and budget. Our service is complimentary and we work for you and the landlord to negotiate the most competitive deal in the market. Let us show you how shared and serviced offices can be the perfect solution for your business. www.office hub.com.au www.office hub.co.nz Conditions apply A portion of the square meterage factors in access to shared space. Price includes any incentives offered. This is for new tenants only. Central Location | A Grade Fitout | Creative Co-working Hub $608pw | 4 Person Workspa..
PROPERTY OVERVIEW $608pw Price incl. Transform the way you work at this one of a kind boutique serviced office in Brisbane. With three freshly renovated floors, plenty of common areas and a sunny spacious balcony, it’s designed with a relaxing colour scheme and all the technology needed for business in this day and age. The like minded community of established startups works hard and socialises often with community events and breakout zones while no lock in contracts and flexible memberships give you the ability to upsize or downsize as your needs change. Locals call this area of Brisbane the Golden Triangle, whether for the financial activity, sophisticated social scene or gorgeous sunny weather, we can’t be certain. Either way, it’s the city’s prime business and recreation quarter with endless trendy restaurants, cafes, shops, bars and gyms giving your team essential out of work entertainment. Getting around is easy by bus and train and the building itself is a cutting edge A grade tower of 26 levels with mezzanine foyer and ground floor retail. The advertised office space is perfect for a team of 4. If you need more or less space, we have over 30,000 furnished workspaces all over the world suitable for a team of 1 to 200+. Our award winning team offer a free service that will help you find the perfect solution for your needs, so reach out if you need more help. What you get for your weekly rent , 24/7 Access , Access to internal breakout areas , Access to kitchen facilities , Building outgoings included , Electricity usage included , Regular cleaning , Fully equipped boardrooms, meeting rooms and day offices , Flexible lease with the ability to grow into bigger space , Plug and play furnished workspace , Commercial grade internet (Free) , Collaborative space with a great community feel Building features , Modern fit out , Natural light , Private offices , Professional environment , Showers , Car parking in building (Paid) , Creative space , Impressive new fit out Right across the road from Queen Street mall. Bus stop out the front of the building 260m to Central Train Station In the heart of Brisbane CBD Shopping and food district. Woolworths/BWS/Dry Cleaners/ Big W across the road. WHO IS OFFICE HUB? Office Hub has largest collection of shared office space, sublet office space, creative coworking office space and serviced offices, perfect for 1 200 employees. Let us take you on a tour of all the spaces that fit your needs and budget. Our service is complimentary and we work for you and the landlord to negotiate the most competitive deal in the market. Let us show you how shared and serviced offices can be the perfect solution for your business. All pricing shown excludes any local taxes such as GST or VAT Conditions apply A portion of the square meterage factors in access to shared space. The advertised price includes any incentives offered based on a 12 month agreement. If a shorter period is agreed to please note the price may increase accordingly. This promotional offer for new tenants only and may be withdrawn at any time due to space availability. Unique Retail Space In Character Building $35,100 Net + Outgoings +..
54m2 retail shop available in the character Blocksidge and Ferguson building. Situated on the first floor, it sits amongst other well known retail businesses, including Pulp Fiction book store. Previously home to a recognised clothing retailer, it would suit similar businesses who are looking for that point of difference. Other features: Open plan design Modern LED recessed lighting Ducted air conditioning 2 way customer entrance Good visibility from the laneway foot traffic Access to water and drainage For more information or to book an inspection contact Alan Simms of Blocksidge Real Estate on 0407 257 862. Modern Refurbished Office In Character Building $65,100 Net P.A. + GST + ..
Small Modern Office Space Ready To Occupy $14,700 P.A. Net + Outgoi.. Prestigious Location | Cafes And Shops Nearby | Abundance Of Natural Light $600pw | 4 Person Workspa..
PROPERTY OVERVIEW $600pw Price incl. Professional serviced office situated in the Golden Circle of Brisbane. Price includes Internet, Electricity, Building Outgoings, Kitchen Flexi terms Golden Triangle Full time access Modern fit out Professional environment Avail NOW for short or long term rent A premium serviced office situated in the Golden Triangle, this office space offers your business an opportunity to work out of a prestigious address that is filled with a variety of modern and flexible options suited to your needs. On top of this we don't believe in surprises or hidden costs, therefore everything is included in your rent to make your life that much easier! The advertised office space is perfect for a team of 4. If you need more or less space, we have over 30,000 furnished workspaces all over the world suitable for a team of 1 to 200+. Our award winning team offer a free service that will help you find the perfect solution for your needs, so reach out if you need more help. What you get for your weekly rent , 24/7 Access , 24/7 Security , Access to internal breakout areas , Access to kitchen facilities , Access to secure printer and scanner , Building outgoings included , Electricity usage included , Flexible terms , One simple bill for everything related to your workspace , Plug and play furnished workspace , Regular cleaning , Secure high speed Internet Building features , Abundance of natural light , Air conditioning , Bicycle storage , Company branding in foyer , Disabled access and facilities , End of trip facilities e.g showers, bike racks , Onsite Cafe / Restaurant , Print, scan and copy facilities , Retail and shopping malls nearby , Taxi / Uber stand close to building 300m to Central Train Station 100m to Riverside CityCat 250m to Anzac Square Walking distance to cafes, restaurants and shopping centre nearby WHO IS OFFICE HUB? Office Hub is Australia & New Zealand\'s No 1 small office space commercial real estate agency. We have the largest collection of shared spaces, coworking and serviced offices in Australia & New Zealand, perfect for 1 100 employees. Let us take you on a tour of all the spaces that fit your needs and budget. Our service is complimentary and we work for you and the landlord to negotiate the most competitive deal in the market. Let us show you how shared and serviced offices can be the perfect solution for your business. www.office hub.com.au www.office hub.co.nz Conditions apply A portion of the square meterage factors in access to shared space. Price includes any incentives offered. This is for new tenants only. A Grade Building | Abundance Of Natural Light | Spectacular Views $1089pw | 6 Person Worksp..
PROPERTY OVERVIEW $1089pw Price incl. Top floor private office suites available in five star serviced office at the Golden Triangle! 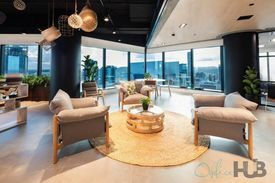 This Brisbane penthouse serviced office features 3m high ceilings with natural light and outstanding river views plus advanced IT infrastructure to deliver uninterrupted connectivity for a seamless work experience. A simply stunning office space available on flexi terms with all costs included in your monthly bill! Brisbane’s Golden Triangle business district is the home of this prestigious 54th level penthouse office at 111 Eagle Street – a prime location for businesses of all shapes, sizes and industries with the Cat Ferry terminal nearby and easy access to bus and rail links. The building follows best practice environmentally sustainable design principles and has achieved a 6 star Green Star As Built rating – a trusted mark of quality, sustainability and design. The building’s courtyard boasts award winning restaurants, hip cafes and relaxing bars, perfect to start your evening there and go on to enjoy the abundance of nearby entertainment options in Brisbane’s exciting CBD. The advertised office space is perfect for a team of 6. If you need more or less space, we have over 30,000 furnished workspaces all over the world suitable for a team of 1 to 200+. Our award winning team offer a free service that will help you find the perfect solution for your needs, so reach out if you need more help. What you get for your weekly rent Premium furnished office with desks, chairs and lock up storage units Commercial grade internet Use of the kitchen facilities with premium coffee/tea provided Electricity usage included Complimentary receptionist to meet and greet your clients Telephone Handset included Ability to bring your existing phone number over Premium business address to advertise Daily cleaning Flexible terms from 1 month 2 years 24 x 7 access to your office 24 x 7 security swipe card access Office features Premium grade office design Full mail management and postage Access to large boardroom and meeting rooms Signage board in foyer to highlight your business name Professional environment Server / Comms rooms available for server storage Building Features Highly recognised and prestigious building 6 Star Green rating 5.5 Star NABERS energy rating Superior end of trip facilities with lockers, change rooms, showers and bicycle parking High speed lifts Outstanding river views 400m to Central train station 125m to Eagle St bus stop 100m to Riverside Ferry wharf 25 minute drive to Brisbane Airport 100m to Brisbane River WHO IS OFFICE HUB? Office Hub is Australia & New Zealand\'s No 1 small office space commercial real estate agency. We have the largest collection of shared spaces, coworking and serviced offices in Australia & New Zealand, perfect for 1 100 employees. Let us take you on a tour of all the spaces that fit your needs and budget. Our service is complimentary and we work for you and the landlord to negotiate the most competitive deal in the market. Let us show you how shared and serviced offices can be the perfect solution for your business. www.office hub.com.au www.office hub.co.nz Conditions apply A portion of the square meterage factors in access to shared space. Price includes any incentives offered. This is for new tenants only. Central Location | A Grade Building | Fully Furnished $7072pw | 50 Person Works..
PROPERTY OVERVIEW $7072pw Price incl. Flexible office space for rent in Brisbane’s prime financial district. This impressive workspace comes from one of the world’s top serviced office operators, delivering a new standard of workplace technology, connectivity and facilities to enhance your working day. Blending a classic corporate fit out with a modern layout to enhance collaboration, it has private offices, coworking desks and virtual offices for rent and the ability to accommodate teams of up to 50 people. The IT in this workspace is undoubtedly one of its most attractive features as it has fibre based Tier 1 internet, 99.99% broadband uptime, low cost international calls on a VOIP network, Cisco Voice and global number portability. The customer service also sets it apart, with extensively trained professionals on hand to take care of reception and admin tasks as well as catering and meeting requests. If you’re interested in this leading Brisbane CBD serviced office, come and meet the team, test the technology and try out the facilities – a quick tour will show you why this office provider is one of the best in the world. This elegant and exclusive serviced office in Brisbane is in one of Australia’s truly iconic buildings. The office tower is known as The Gold Tower for its extraordinary colour and at 135m tall it can be seen from most parts of the city – upon completion in 1977 it was Brisbane’s tallest building. The standout features are the instantly recognisable gold colour, floor plate shaped like the map of Australia and environmentally friendly measures including T5 lighting and sensor lighting which have seen it achieve a 4.5 star NABERS energy rating and 4.0 star NABERS water rating. In house amenities include change rooms, shower, secure bike storage, dry cleaning services, onsite concierge and security. This serviced office offers beautiful views of the Brisbane River, Story Bridge and Moreton Bay and it’s close to the GPO and Eagle Street Pier's restaurant precinct. The advertised office space is perfect for a team of 50. If you need more or less space, we have over 30,000 furnished workspaces all over the world suitable for a team of 1 to 200+. Our award winning team offer a free service that will help you find the perfect solution for your needs, so reach out if you need more help. What you get for your weekly rent Furnished office with desks, chairs and lock up storage units Commercial grade internet service Telephone line and personalised phone answering Use of kitchen facilities with premium coffee/tea service Electricity usage included Complimentary receptionist to meet and greet your clients Prestigious business address Flexible terms from 1 month to long term Ability to bring your existing phone number over Business lounge with complimentary break out areas 24 x 7 Access to your office 24 x 7 security Office features Immaculate fit out and facilities Full mail management and postage Large boardroom and meeting rooms Signage board in foyer to highlight your business name Professional environment Server / Comms rooms available for server storage Building features Modern high rise classified as an "A" grade building 24 x 7 access to your office High speed lifts Car parking in building and surrounding areas Dedicated on site management team The advertised price includes building outgoings and is based on one person occupying the workspace. If you have 2 or more people extra fees will apply to cover off services like telephone, internet and kitchen amenities. 10m to Eagle & Charlotte Street bus stops 91m to Eagle Street Pier Ferry Terminal 650m to Central Station 600m to Queens Plaza 210m to Fitness First Who is Office Hub? Office Hub is the world\'s No.1 marketplace for office space. We have a huge global selection of coworking spaces, serviced offices and shared office spaces with flexible options to suit teams from 1 200 people. We\'ll take you on a tour of all the workspaces that fit your needs and work on your behalf to get the best price possible. We\'ll help you discover how shared office space can be the most beneficial and budget friendly solution for your business. www.office hub.com Conditions apply – the advertised price includes any incentives offered based on a 12 month agreement and is available to new tenants only. Please note that the rental rate may increase for a shorter rental period. A portion of the square meterage factors in access to shared space. Fabulous Views | Iconic Location | Stunning Waterfront Precinct $540pw | 3 Person Workspa..
PROPERTY OVERVIEW $540pw Price incl. Professional serviced office situated in the Golden Circle of Brisbane. Price includes Internet, Electricity, Building Outgoings, Kitchen Flexi terms Golden Triangle Full time access Modern fit out Professional environment Avail NOW for short or long term rent A premium serviced office situated in the Golden Triangle, this office space offers your business an opportunity to work out of a prestigious address that is filled with a variety of modern and flexible options suited to your needs. On top of this we don't believe in surprises or hidden costs, therefore everything is included in your rent to make your life that much easier! The advertised office space is perfect for a team of 3. If you need more or less space, we have over 30,000 furnished workspaces all over the world suitable for a team of 1 to 200+. Our award winning team offer a free service that will help you find the perfect solution for your needs, so reach out if you need more help. What you get for your weekly rent , 24/7 Access , 24/7 Security , Access to internal breakout areas , Access to kitchen facilities , Access to secure printer and scanner , Building outgoings included , Electricity usage included , Flexible terms , One simple bill for everything related to your workspace , Plug and play furnished workspace , Regular cleaning , Secure high speed Internet Building features , Abundance of natural light , Air conditioning , Bicycle storage , Company branding in foyer , Disabled access and facilities , End of trip facilities e.g showers, bike racks , Onsite Cafe / Restaurant , Print, scan and copy facilities , Retail and shopping malls nearby , Taxi / Uber stand close to building 300m to Central Train Station 100m to Riverside CityCat 250m to Anzac Square Walking distance to cafes, restaurants and shopping centre nearby WHO IS OFFICE HUB? Office Hub has largest collection of shared office space, sublet office space, creative coworking office space and serviced offices, perfect for 1 200 employees. Let us take you on a tour of all the spaces that fit your needs and budget. Our service is complimentary and we work for you and the landlord to negotiate the most competitive deal in the market. Let us show you how shared and serviced offices can be the perfect solution for your business. All pricing shown excludes any local taxes such as GST or VAT Conditions apply A portion of the square meterage factors in access to shared space. The advertised price includes any incentives offered based on a 12 month agreement. If a shorter period is agreed to please note the price may increase accordingly. This promotional offer for new tenants only and may be withdrawn at any time due to space availability. Central Location | Bike Racks & Showers | Fully Furnished $2800pw | 14 Person Works..
PROPERTY OVERVIEW $2800pw Price incl. A five star office centre designed to attract professionals seeking more from their working environment! The contemporary space combines a wide variety of offices, formal and informal meeting rooms, collaborative coworking spaces and stunning kitchen facilities. Style and functionality are both vital, with beautiful timber, glass and plant life plus the latest tech and fully equipped meeting rooms creating a refreshing and contemporary place to work and host clients. Fully furnished & available now on long or short term lease! This B grade high rise office building is situated in an incomparably central location in the Golden Triangle – the heart of Brisbane CBD with excellent commute convenience and lots of fun after work options. Central Station is a five minute walk away and the RiverCat ferry and bus stops are even closer. The building is equipped with all modern amenities including showers, bike racks, air con and disabled facilities. The advertised office space is perfect for a team of 14. If you need more or less space, we have over 30,000 furnished workspaces all over the world suitable for a team of 1 to 200+. Our award winning team offer a free service that will help you find the perfect solution for your needs, so reach out if you need more help. What you get for your weekly rent Furnished with desks, chairs and storage Commercial grade internet Electricity included Building outgoing included Regular cleaning Access to shared meeting rooms Access to shared kitchen facilities Flexible terms 24/7 access Office and building features Air conditioning Administration support available Catering services available Business lounge Conference facilities available Bike racks Disabled facilities Shower facilities Car parking available in the building Dedicated mens and ladies bathrooms 350m to Central Station 150m to Riverside CityCat ferry 20m to Adelaide/Creek Street bus stop 450m to Queen Street Mall 100m to Eagle Street entertainment precinct Who is Office Hub? Office Hub is the world\'s No.1 marketplace for office space. We have a huge global selection of coworking spaces, serviced offices and shared office spaces with flexible options to suit teams from 1 200 people. We\'ll take you on a tour of all the workspaces that fit your needs and work on your behalf to get the best price possible. We\'ll help you discover how shared office space can be the most beneficial and budget friendly solution for your business. www.office hub.com Conditions apply – the advertised price includes any incentives offered based on a 12 month agreement and is available to new tenants only. Please note that the rental rate may increase for a shorter rental period. A portion of the square meterage factors in access to shared space. Abundance Of Natural Light | Fully Furnished | Cafes And Shops Nearby $1381pw | 5 Person Worksp..
PROPERTY OVERVIEW $1381pw Price incl. A serviced office with a difference – super cool design, creative styling and a buzz of activity among coworkers. It has spectacular elevated views from Brisbane’s iconic Waterfront Place development and offers a stimulating working environment for both groups and individuals. Fully supported by front of house managers and concierge, you’ll discover a new way of working at this first rate business centre. Meeting and event space is flexible in configuration to support every client meeting or partner event you might host. Located in the Riverside Precinct right near Eagle Street Pier, this serviced office sits on the edge of the sought after Golden Triangle of Brisbane. The WaterFront Centre at 1 Eagle Street is only a short walking distance to some of Brisbane’s top restaurants. This office is just next door to the prestigious Stamford Plaza and Polo Clubs, a short stroll to the Botanical Gardens and in close proximity to the Convention Centre at South Bank. The advertised office space is perfect for a team of 5. If you need more or less space, we have over 30,000 furnished workspaces all over the world suitable for a team of 1 to 200+. Our award winning team offer a free service that will help you find the perfect solution for your needs, so reach out if you need more help. What you get for your weekly rent , 24/7 Access , 24/7 Security , Access to internal breakout areas , Access to kitchen facilities , Access to secure printer and scanner , Building outgoings included , Electricity usage included , Flexible terms , Lockable storage unit , One simple bill for everything related to your workspace , Plug and play furnished workspace , Regular cleaning , Secure high speed Internet Building features , Abundance of natural light , Air conditioning , Bicycle storage , Car parking in building (Paid) , Company branding in foyer , Disabled access and facilities , Onsite Cafe / Restaurant , Print, scan and copy facilities , Taxi / Uber stand close to building 230m to Stamford Plaza Brisbane 250m to Central Train Station 150m to Eagle Street Ferry Peir 900m to King Edward Park Who is Office Hub? Office Hub is the world\'s No.1 marketplace for office space. We have a huge global selection of coworking spaces, serviced offices and shared office spaces with flexible options to suit teams from 1 200 people. We\'ll take you on a tour of all the workspaces that fit your needs and work on your behalf to get the best price possible. We\'ll help you discover how shared office space can be the most beneficial and budget friendly solution for your business. www.office hub.com Conditions apply – the advertised price includes any incentives offered based on a 12 month agreement and is available to new tenants only. Please note that the rental rate may increase for a shorter rental period. A portion of the square meterage factors in access to shared space.